Polythene UK is proud to announce that we will be continuing our sponsorship of the Oxford United Ladies team next season. We have sponsored United’s First Team and Ladies’ sides for the last few years. Next year we will continue to sponsor the ladies, who will wear the Polythene UK logo on their first team shirts. 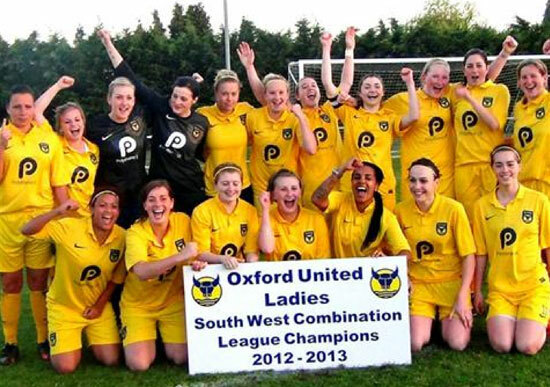 Oxford United Ladies finished their brilliant title-winning season with a comprehensive 3-0 win over neighbours Swindon Town and have now been promoted to the Womens Super League 2. The U’s won their bid to play in the revamped league structure for 2014 where their opponents will be Aston Villa, Doncaster Rovers Belles, Durham, London Bees (Barnet FC), Millwall Lionesses, Reading, Sunderland, Watford and Yeovil Town. They will be playing only one level below the top flight – Women’s Super League 1. Some of the current players have been with the club since they were 14 or 15 and in all that time have been sponsored by Polythene UK. It is great that they will be wearing our name on the shirts when they kick off in the WSL next season. The whole Ladies Squad visited Polythene UK’s new offices to celebrate the continued partnership. James commented, “We are very proud to have been associated with the ladies team for the last four years and to have played a small part in helping them grow. They are a credit to the club and to have reached the level they have, in such a short space of time, is a brilliant achievement”.